EM4x4SS Suitable for 4x4s Van and Motorhomes. * Fits in seconds without the use of a key. * High security drill and pick resistant lock. 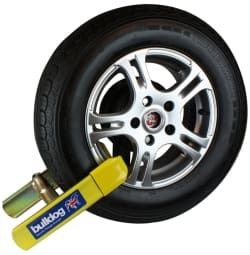 * Fitted with protective tips to eliminate damage to alloy wheels. * Strengthened steel locking arms. * Portable and easily stored. * Recommended for alloy wheels. * Sold Secure Gold Approved. "ITS GOOD because the compact dimensions and its weight make it a good choice for touring.It is easy to fit too - you simply slide the arms apart,fit the hooks on to the wheel rim, push the arms together and lock." "BUY IT IF you need a clamp thats not bulky yet still has a high security rating."